Being the only girl cycling with fifteen or so men and not chicking them wasn’t the plan. Being the only girl cycling with fifteen or so men and getting dropped was most definitely not the plan. (They were nice enough, I didn’t.) Especially after writing to Bristol Road Club to ask them to kindly amend the line ‘beginner rides are suitable for women and children’ on their website, which they did to my pleasant surprise. The least I could have done would be to turn up and keep up. Well, really Janine. There are no photos of this beautiful 55-mile ride, because I was too busy trying to keep them in sight. But here’s a photo of what I cycled up. They gave me a head start, yet the pack silently whirred past me a few minutes in… I actually enjoyed the climb though. It was white, snowy, pretty and gradual. And nice they were. I wasn’t dropped actually. Not once during the 55 miles cycle loop through Cheddar. A mere technicality of course, because the regulars seemed to take it in turns to cycle with me at the back until we reached the pack, who were quite stationary by this point of course. 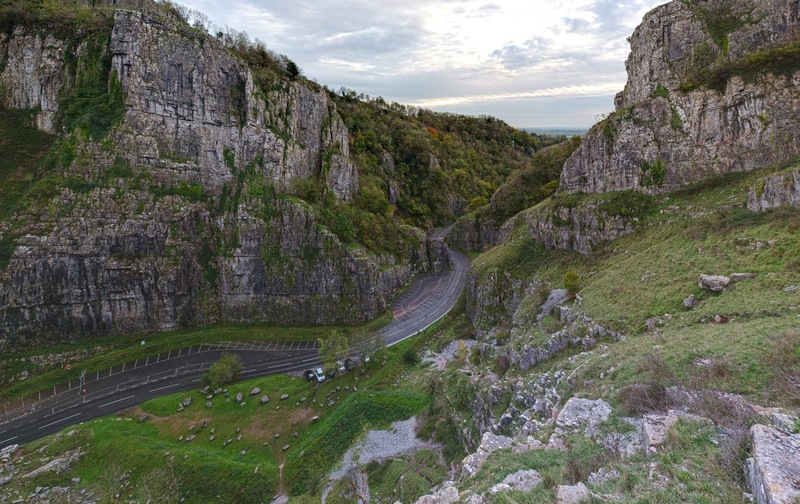 The coffee stop at the bottom of Cheddar Gorge was quite the eye opener. My legs were on fire by this point, and I had firmly promised myself that if I made it to the bottom of the Gorge with these men in site, that I’d pretend to ride back alone but sneakily catch the train. Of course they were having none of that and nor was I. At a mere hint of this, whilst chucking a salmon and cream cheese sarnie down my gullet quicker that you can that say ‘that sounds disgusting’, stories were regaled of men ‘with all the gear and no idea’ who may have done exactly that. It’s just not cool unfortunately to catch the train home if your bike’s in one piece. So after said speedy sustenance and a giant coffee, ’twas up the Gorge I headed, and into twenty more miles of teeth grinding, quad screaming pure pleasure. The desire to cryvomit turned into smiles again. Two guys were cycling with me in the last few miles and I got the impression they weren’t holding back so that felt more like fun again. And then – like a mirage of a promise land, Ashton Court appeared before my eyes and it was all over. They said to me ‘you are more than fit enough to do this – I know when I see someone who’s struggling believe me. In three or four runs you’ll be fine’. Praise indeed. Now – they say that an easy ride is better recovery than doing nothing, so today I cycled 30 miles to Clevedon, ate cake and cycled back through mud and ice, narrowly avoided a stint on the M5 and asked a policeman manning a crash site for help, but that’s another cycle story. Terrifying it may sometimes be, but it’s never dull.